A fantastic shoot sadly comes to an end. 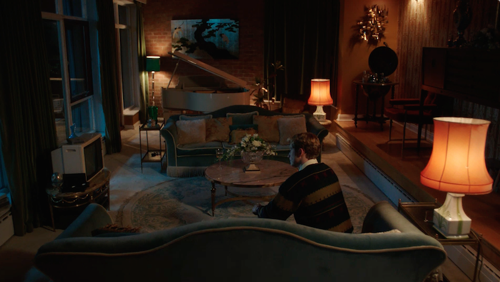 Enormous thanks to director Dominic Leclerc, producer Jules Hussey and production designer Janice Flint for their unwavering commitment to achieving creative excellence at all times. 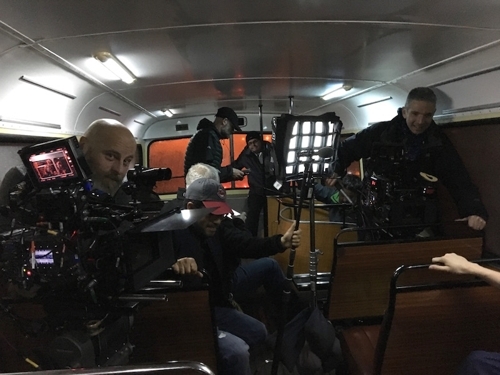 I had a tremendous front line crew in camera operator Martin Foley, focus puller Emma Friend, gaffer Chris Georgas and grip Phil Whittaker. A big thank you to all of you and your respective crews - in themselves all equally superb in their attention to detail, diligence and unstinting professionalism. 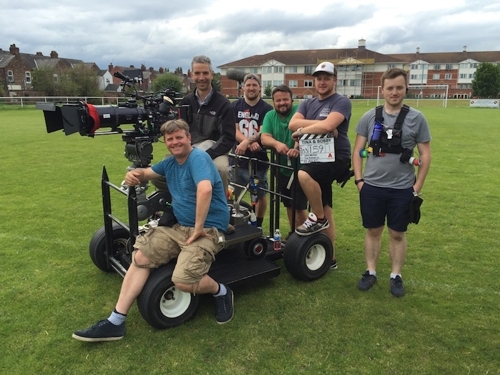 From left to right: Chris Georgas, gaffer; Paul Surgison, best boy; Max De Nett, standby props; Mairead Albiston, 2nd AC; Emma Friend, focus pulller. It almost looks like there should be a cigarette in my hand and someone has painted it out. 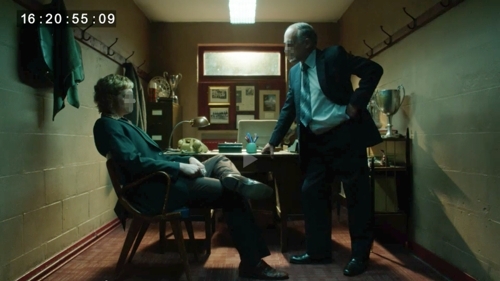 It's been twenty five years but the thought still crosses my mind every day and in this rare moment of pleasant idle banter with the director there surely was an imaginary ciggy clasped firmly between my fingers. 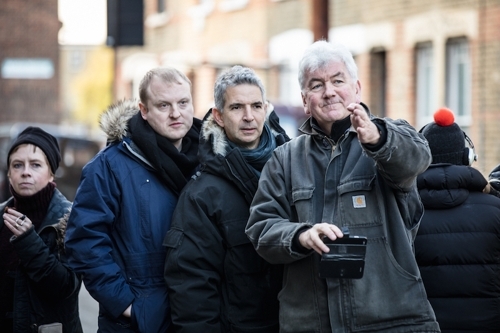 Director Dominic Leclerc and I are sure it's that way but camera operator Martin Foley is insistent that it is this way. Martin's always right. I just can't help myself. Stanley is everywhere. His pull is inexorable. A very small location with no windows to the outside world but it was important to carry through a sense of strong daylight. A lamp on a stand would have been too close. It would not have provided defined enough shadows and would have required a forest of flags and nets to control the rapid fall off of light. A mirror is always a good solution in these situations because it doubles the source to subject distance, which results in a more even throw, sharper shadows and no need for any flagging. I christened them 'Caspers'. 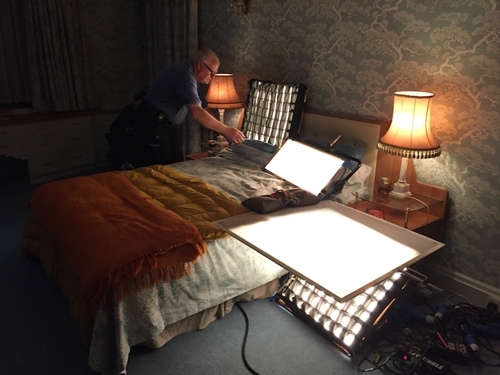 Gaffer Chris Georgas likes his bleached muslin and drapes it over everything - to good effect. On his last job he went through 50 metres of the stuff and I can see why. It is easily cut into all shapes and sizes and then often discarded. 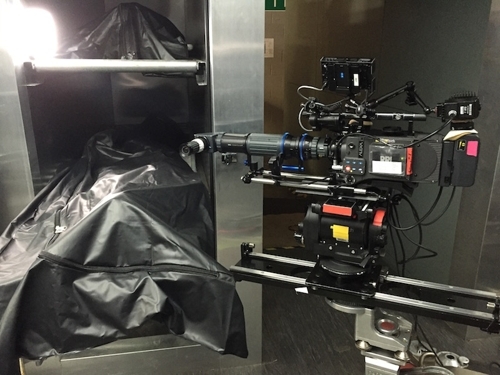 It works as well hanging loosely off a Dedo Octodome as it does pulled tight across the doors of a 4x4 KinoFlo. 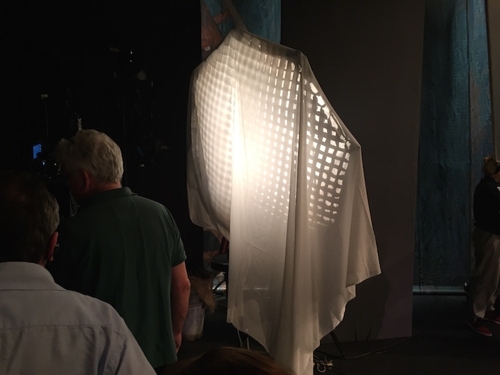 Interestingly the muslin softens the light by spreading it rather than diffusing it so it remains relatively directional. 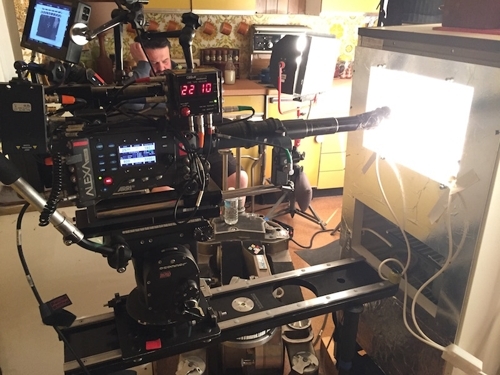 This can be a real advantage in a small space, as seen with the KinoFlo Flathead. Why do I always find myself in this situation? Big wide shot; person by a table lamp obviously being lit by said lamp. LED technology just keeps getting better and more user friendly by the month. Here, a Lite Panels Lite Ribbon with an improvised diffuser does the trick. 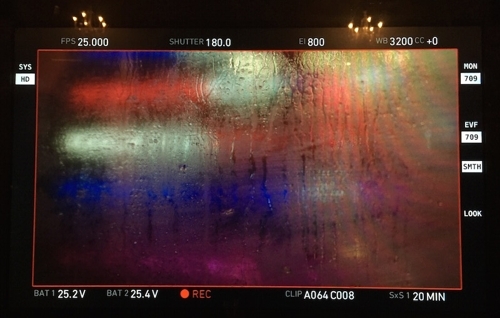 Steamy windows and neon to introduce a New York bar, achieved by shooting through a piece of glass positioned at a 45 degree angle to the camera and reflecting an array of lighting off camera. Same principle as Autocue. 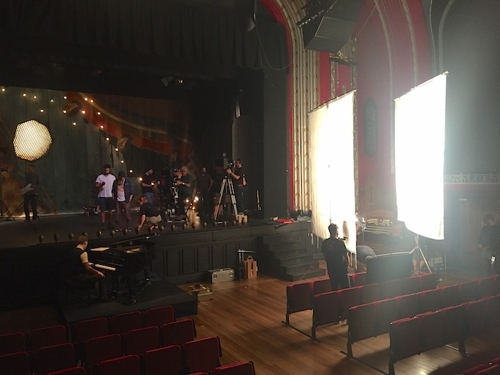 Gaffer Chris Georgas is very adept at shoehorning the biggest softest bounce and double bounce lighting into compact and crowded spaces. 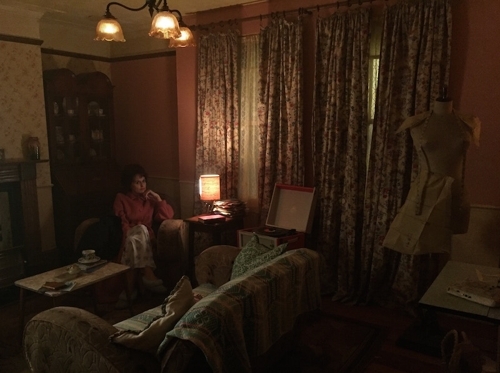 The even spread of light makes shooting ensemble scenes a breeze. Some lovely period film props for the recreation of a scene from 'Carry On'. 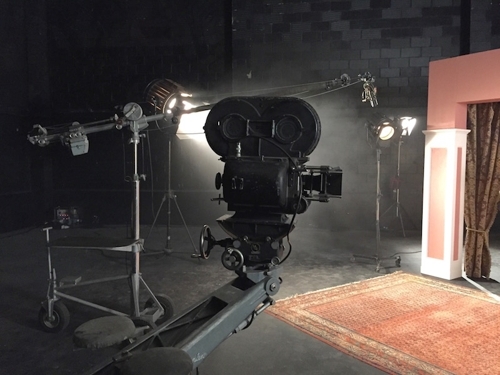 The Big-Eye 10Ks were all practical and used to light the scene. 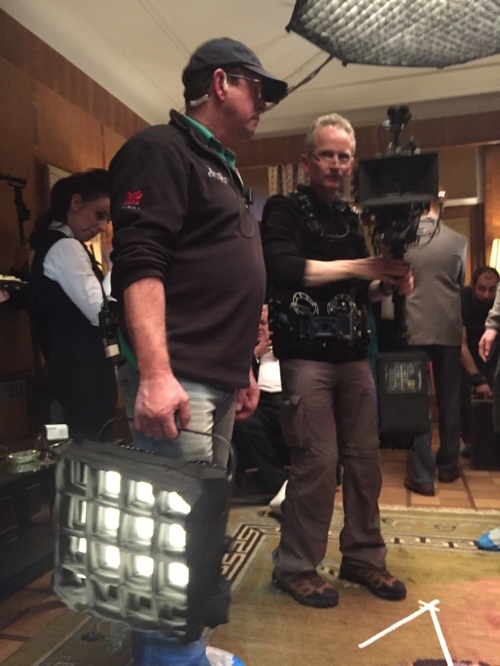 I was particularly taken with the dimpled reflector board, which delivered the perfect hard/soft light mix. Shame they're not made like that anymore. Using a focusing spotlight for a controlled bounce can really help in a small location. 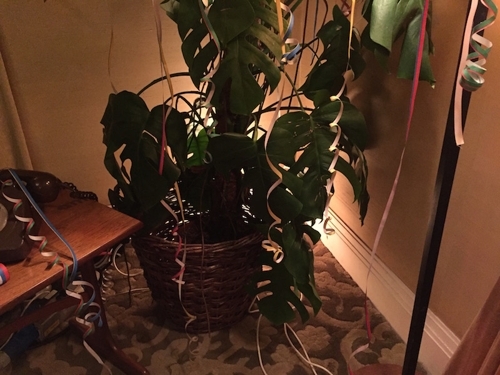 Success depends on having a knowledgeable electrician who can quickly position the internal leaves to reflect the shape of the surface to be bounced off. Enter Chris Georgas! 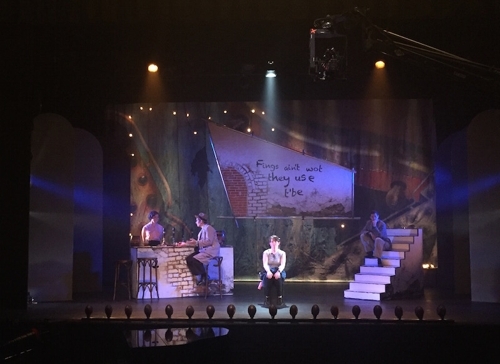 A great privilege to have collaborated with acclaimed Olivier Award winning lighting designer, Natasha Chivers, on the theatrical sequences for 'Babs'. Stand-ins waiting here for the lights to be focused. 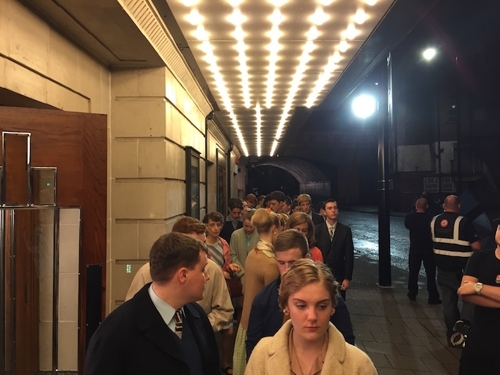 Airstar supplied the two 8kw tungsten lighting balloons used to light the auditorium of the Catford Broadway Theatre on 'Babs'. Gaffer Chris Georgas is calling the shots from the footlights. 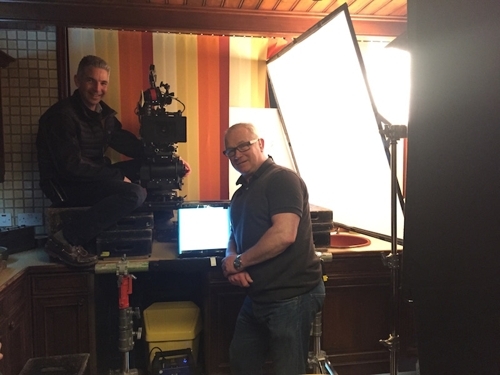 Chris and his team, notably best boy Paul Surgison, worked incredibly hard in the week preceding the start of principle photography, changing all the light bulbs in the chandeliers and wall lights. There were forty bulbs of different wattage and colour in each chandelier. Everything had to be swapped out and the chandeliers, some of which had not been touched for decades, could only be accessed after being lowered on winches from the roof space - a painstaking and hazardous task. 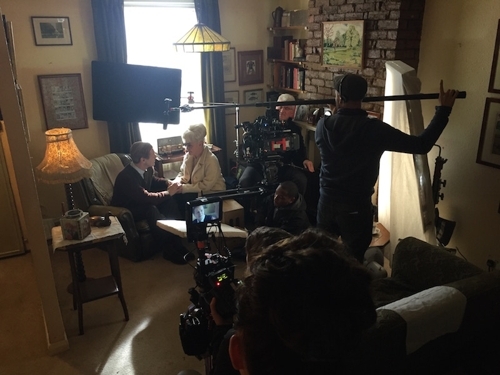 Principle photography begins on BBC1 programme 'Babs', dramatising the life of Dame Barbara Windsor. 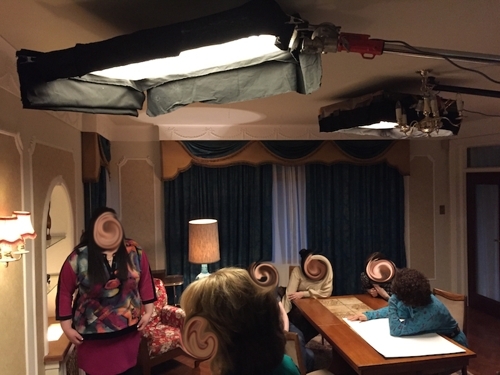 'Babs' is a Red Planet production for BBC1, directed by Dominic Leclerc and produced by Jules Hussey. Sorry for the lack of updates. 'Babs' shooting schedule and torturous commute got the better of me. 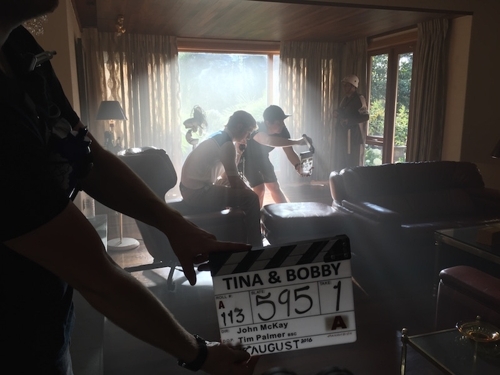 Here's one last entry for 'Tina and Bobby'. 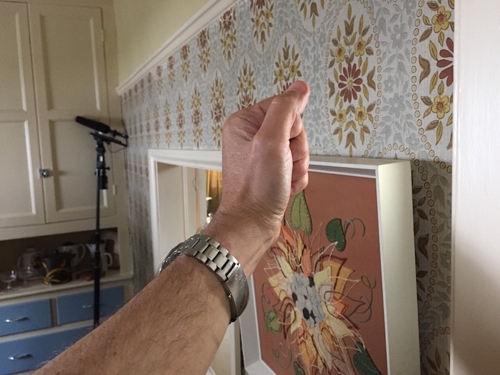 Recreating the effect of a plane banking when filming on a static aeroplane necessitated a marriage of grips and electricians. When has that ever happened? They got on pretty well but to be safe, I had them sign a pre nup. 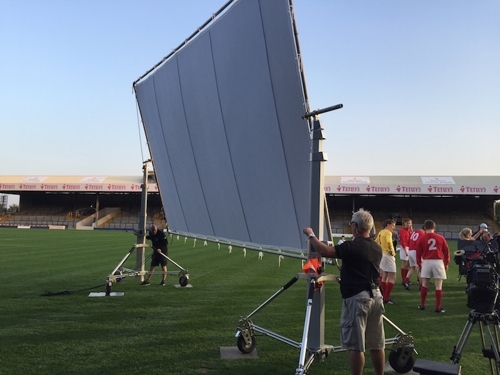 Filming on Headingley's pristine pitch in fading summer sunlight, we had to bring in a 20' x 12' frame. The Avenger Long John Silver lighting stands took the wieght of the frame with ease. The big pneumatic tyres glided over the turf without even leaving a tyre mark and the pags only went down when the frame was in place. The groundsman was delighted. A little bit over the top perhaps but lots of fun nonetheless. 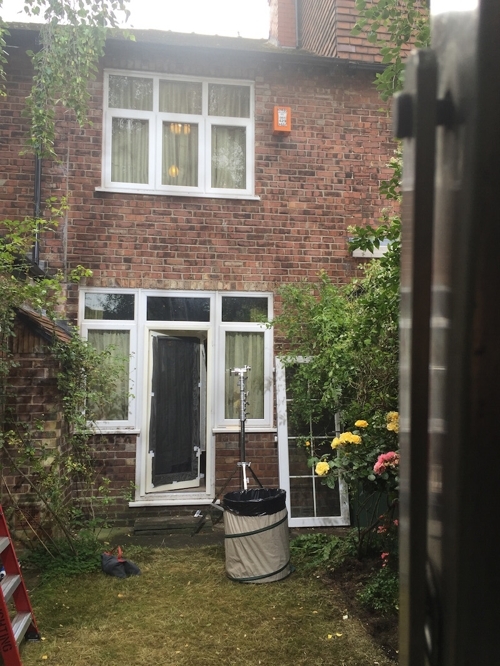 This is a Hong Kong flat made in a suburban house outside Manchester. Another gigantic blackout tent but it was essential to have space to hang neons outside the windows to suggest Hong Kong street life at night. 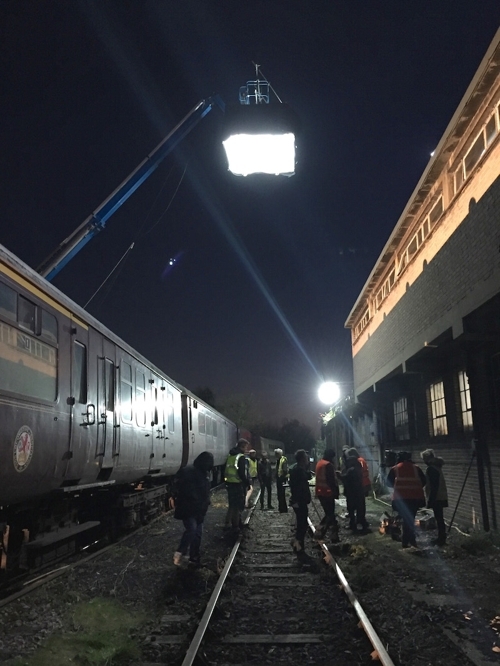 To recreate the hot South American light, an 18K Arrimax fully spotted did the trick. This is one of the biggest blackout tents I've ever asked for. We kew that there was going to be a lot of night work in this location but the main space had floor to ceiling picture windows running the length of the room. 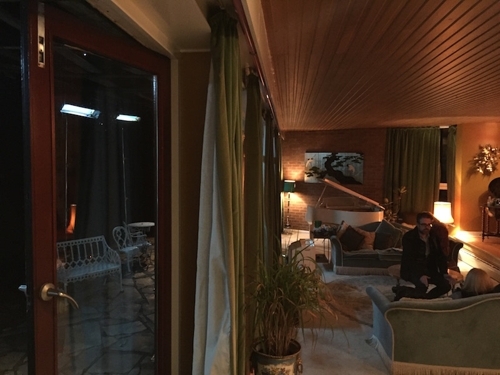 The production designer, Claire Kenny, quite rightly did not want to put up curtains as they would spoil the clean lines of the modernist architecture. 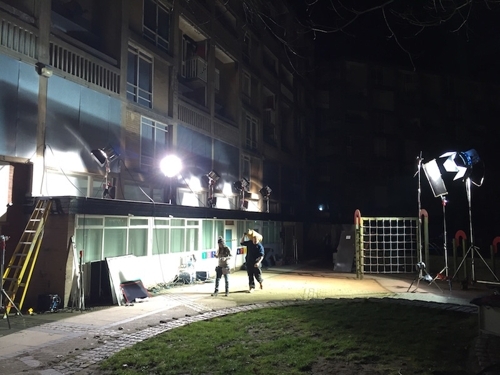 It therefore made sense to try and light from outside as much as possible, which would mean tenting as the schedule did not allow for any night for night filming. The tent would have to be high and deep and large enough to create a meaningful outside space within it. The exterior walls that jutted out from each end of the building were our saviour. They created a perfect support for the scaffolding, which meant that surprisingly little construction was needed and it could all be done quickly and relatively cheaply. How lucky was that! 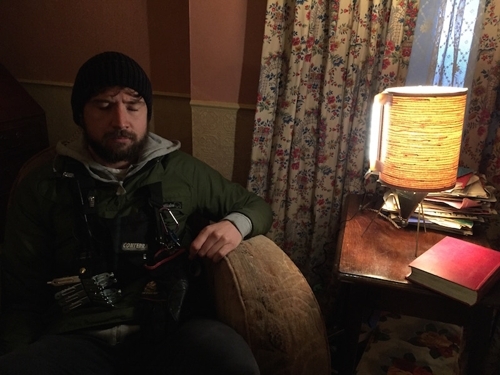 This is a typical situation where a person is behind a table lamp and he or she must look like they are being lit by the practical but without the lampshade itself being overexposed. Literibbon LED made by Lightgear worked well taped to the blind side of the lampshade. Like all modern LEDs it is bi-colour and fully dimmable. Grip Marc Tempest got his meccano kit out to build this rig for a staircase landing shot. The Ronford Billet Bazooka is very versatile. ...and 'The Shining'. 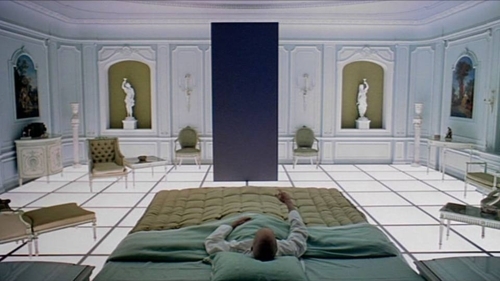 Kubrick had a masterful way of making small, innocuous spaces cinematically impressive. 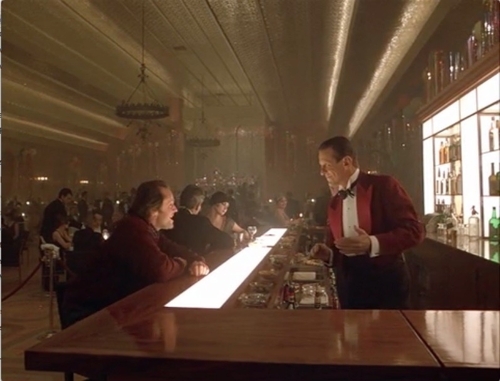 Always on the lookout to satisfy a lifelong obsession with Stanley Kubrick's framing, there's a little game I play with myself on every job: to see how many Kubrickian frames it is possible to emulate. Here's a stab at the Monolith. Wrong colour, I know and in the actual shot I didn't cut off the actor's toes! 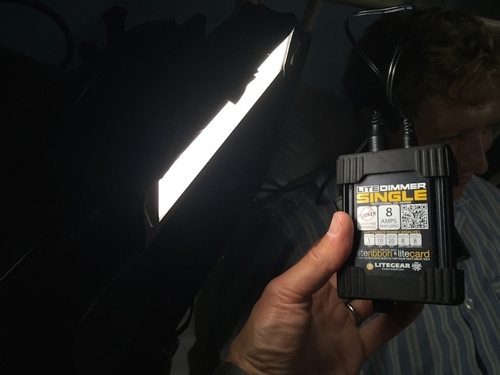 I've been wanting to try out remote phosphor LED technology for some time. The colour purity is better than the highest CRI rated conventional LED fixture. 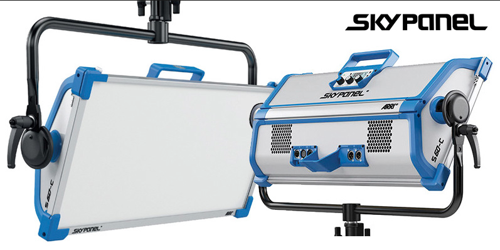 Matchstix by Cineo is a very versatile system; mains or AA battery powered, with colour temperature switchable by swapping filter inserts graded as 3200K, 4300K and 5600K. It's quite old fashioned in that respect especially when accustomed to bi-colour LEDs but a price well worth paying for amazing colour neutrality. The Matchstix is a great on camera eye light. The problem with most LEDs is that they are TOO bright and require a mess of ND gel to get them down to the right level for an eye light. The Matchstix has a low power switch which, when activated, allows the light to dim smoothly down to nearly nothing. 50' Techno put to good use recreating the English and German teams' emergence from the players' tunnel at the 1966 World Cup. Headingley stood in for Wembley and the weather was glorious. 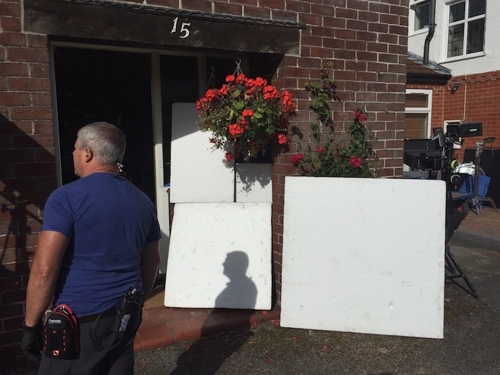 When a 20 x 12 and a 12 x 12 bounce were still not enough and the sparks had run out of rags and frames, PKE Lighting's lovely white truck literally and metaphorically filled the gap. At least we had enough lamps! 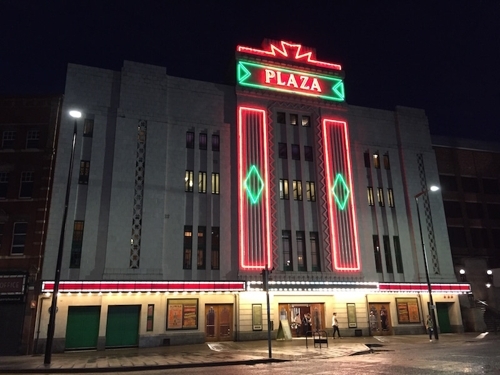 To light the front of the Stockport Plaza and then back light the crowd queuing to get in, all that was needed was the central column of pods on a half Dino. 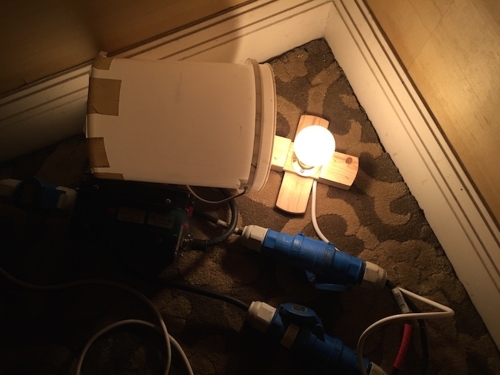 It never ceases to amaze me how magically even the spread of light from a Dino or Maxi Brute can be when the lamp is set right. 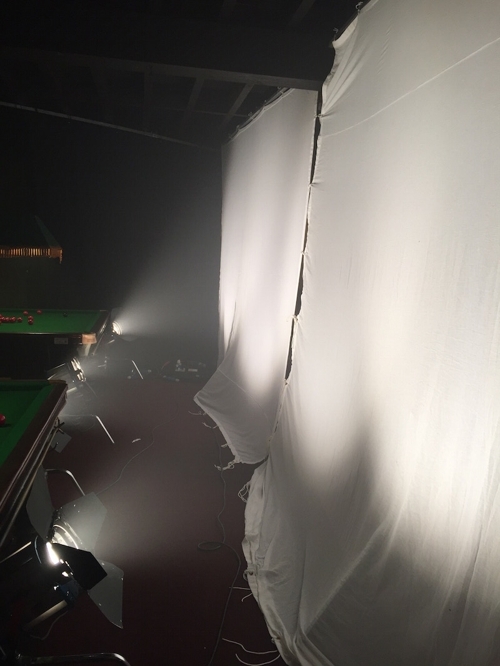 There is no need for any flagging or netting as inevitably there would be with a single source fresnel. The lamp was not that far away from the building and not even on a cherry picker. 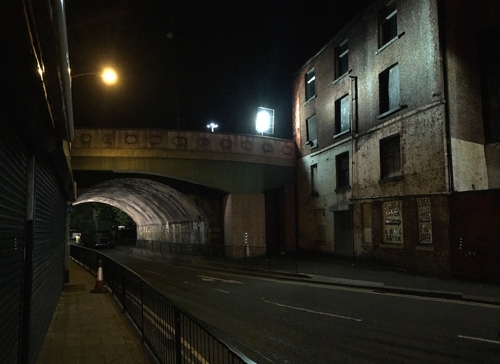 It can be seen in the picture below in its position on an adjacent bridge. Wish I could take credit for this lighting but truthfully cannot. 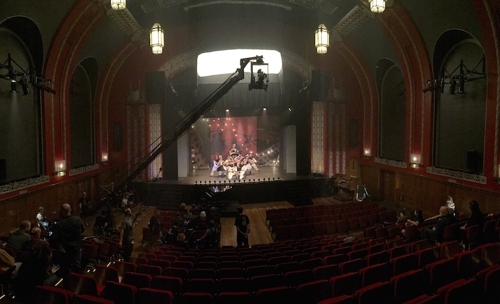 The set was lit with Arri M90s on three scissor lifts - one for each window. This being Manchester, it was was drizzly all day which suited us just fine. On the last scene of the day the clouds broke and the sun blasted through at the perfect angle. There was nothing to be done about it but to embrace our good fortune. Luckily the sun held for the wide shot. Here director John McKay gives notes to the actress. I remembered what I liked doing as a child - always trying to get things to fit into other things. Couldn't help myself constructing this patchwork of poly. The electricians were singularly unimpressed with my handiwork. 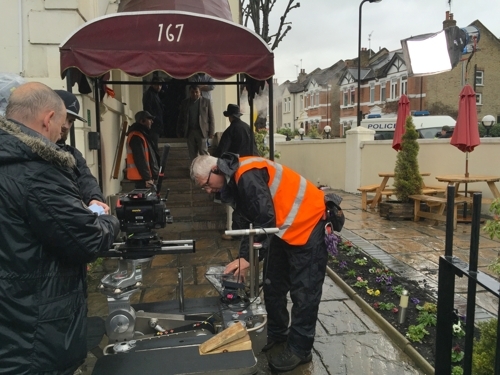 For an upstairs location with very limited access for a conventional dolly, grip Marc Tempest suggested Chapman's Cobra Dolly. Separating into two component parts: the base and the column, the dolly is easily transportable. 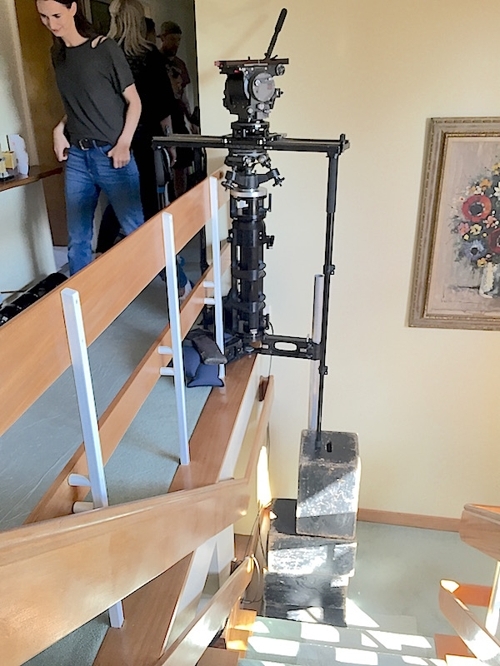 It runs on narrow gauge track (more about that later) and is perfectly balanced for the operator to perform his or her own jibs - much like a studio ped camera. The Cobra provided all the flexibility of camera movement we needed except for the fact that the tracking was sticky. Marc soon realised that the wheelspan did not fit the recommended 16" narrow gauge track. The span was in fact 16.5" - take note Chapman. Ever resourceful, Marc Tempest knocked up his own 16.5" track out of scaffold tube (see photo below) and the problem was swiftly eradicated. The dolly tracked beautifully. The WRONG track. David 'Davey Smoke' McKay looking on with keen interest. 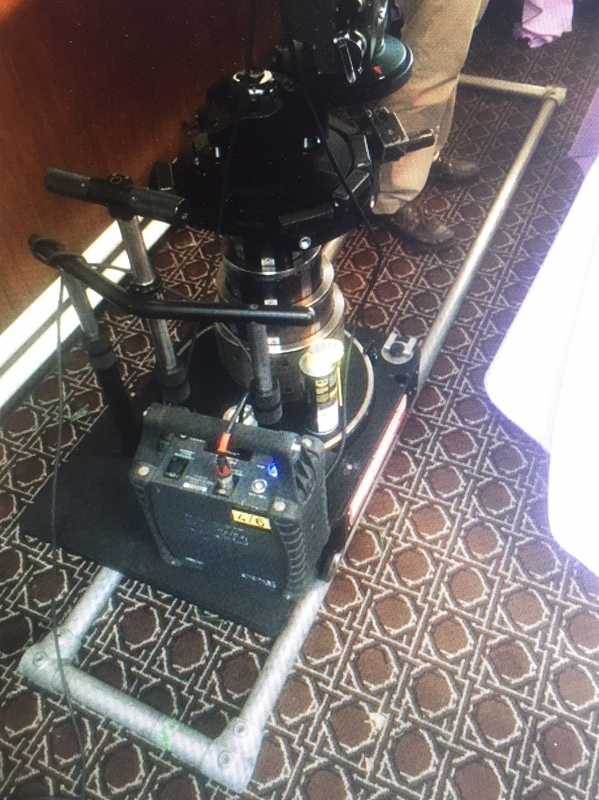 Marc Tempest demonstrating the Chapman Cobra Dolly. 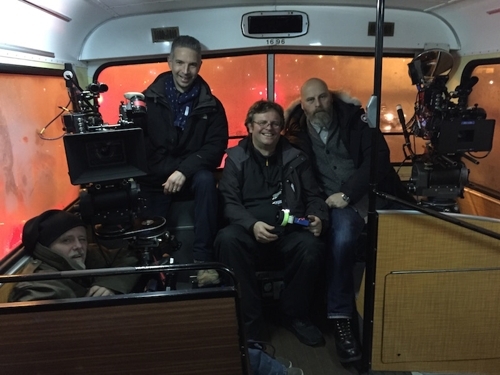 Riding the Beast - from left to right: Steve Marles, Focus Puller; Tim Palmer BSC, DoP; Philip Lake, Assistant Grip; Marc Tempest, Grip; Matt Noon, 2nd AC; Carl Noble, Camera Trainee. 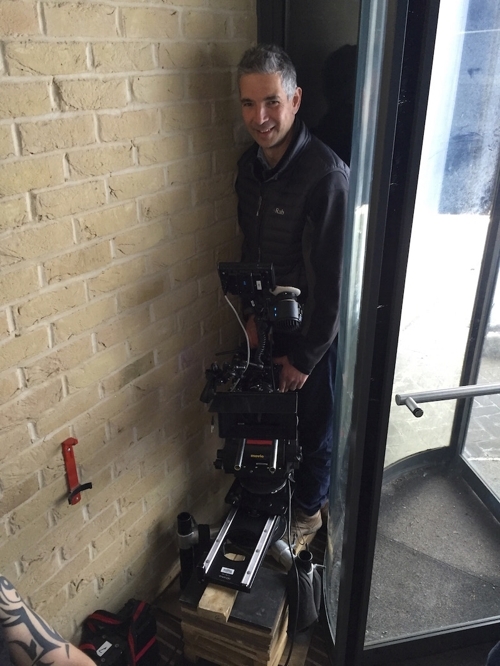 I always thought that you mounted the camera straight onto the dolly. Our ace grip, Marc Tempest, taught me otherwise and demonstrated below. As the saying goes, every day is a school day. This monster supplied by Panavision grips allowed the Peewee to ride on the Western. 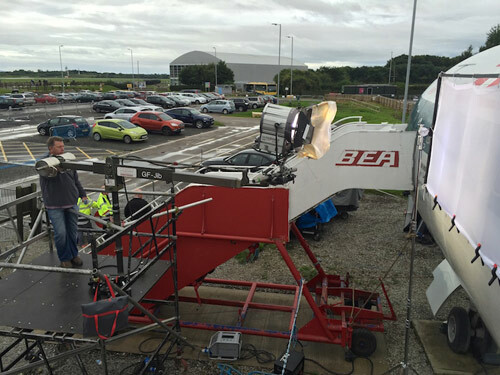 It worked surprisingly well - and no, we never used it at the top of the jib. I was just curious to see how much it wobbled. LED lighting options get better and better. What a simple, naturalistic and flexible way to light the front seat driver and passenger. 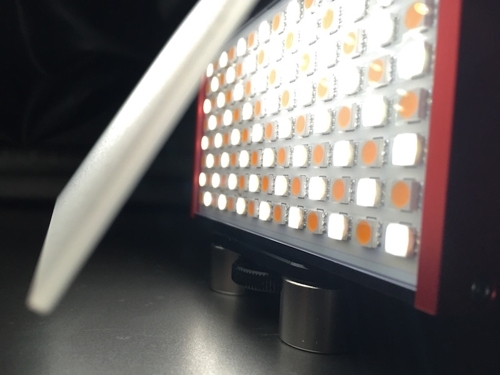 The Litegear LED Literibbon is battery powered, bi-colour and fully dimmable. The even spread of a continuous single source that spans the width of the dashboard is impossible to recreate with any other type of lighting unit - at least with such ease and speed. 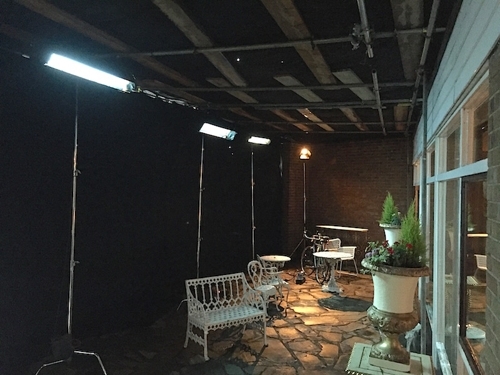 A neat solution for creating back light in a downstairs space at a location where there is no room to put any lighting in a small and very narrow garden without it always being in shot. 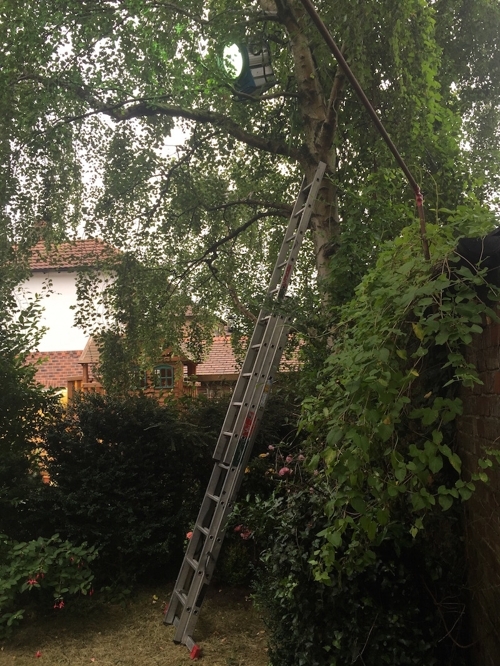 There is no access to any neighbouring properties to situate a lighting tower or cherry picker. 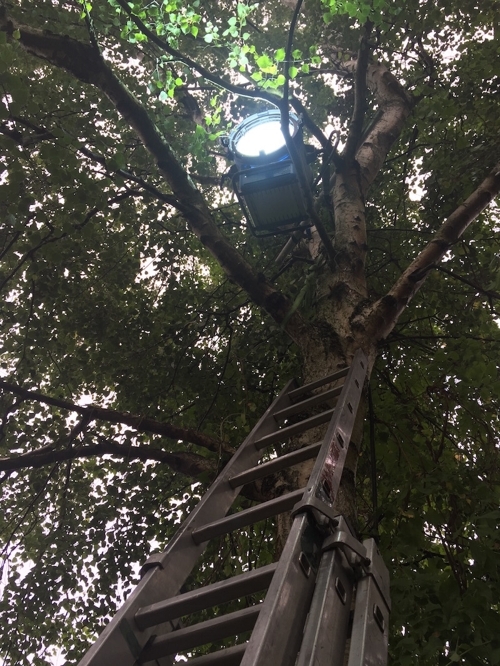 Luckily there is a perfectly placed tree at the end of the of the garden from which to rig a 6KW HMI at exactly the right height to provide a great back light whilst enabling the camera to look out into the garden. 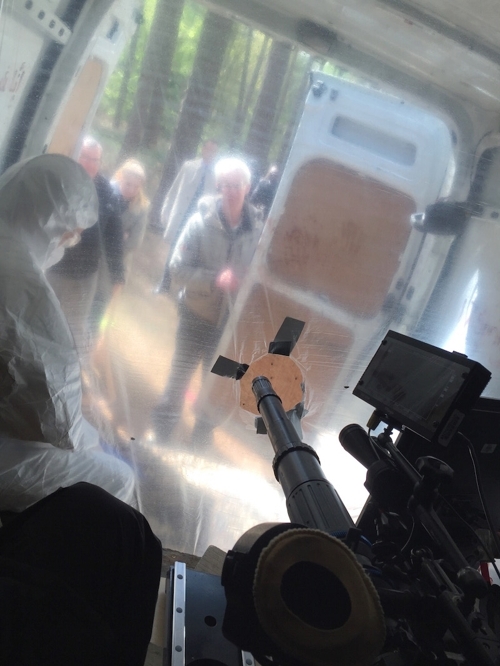 Into the third week of filming now, the Dedoflex Octadome has proven invaluable in a host of tight locations. 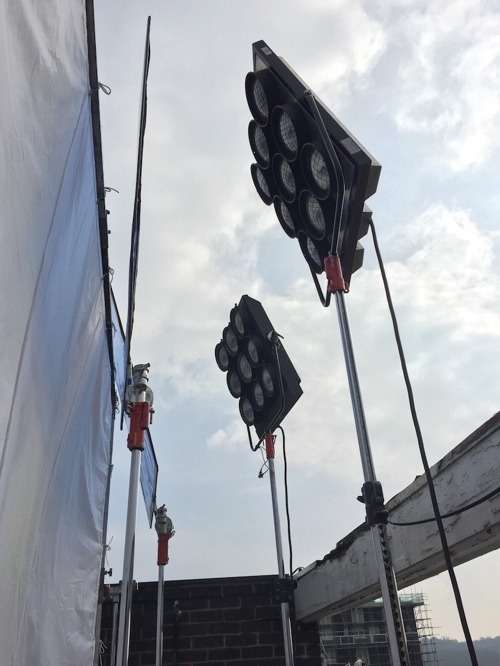 The narrow profile, ease of rigging and eggcrate control makes it the perfect overhead soft light when space is at a premium. 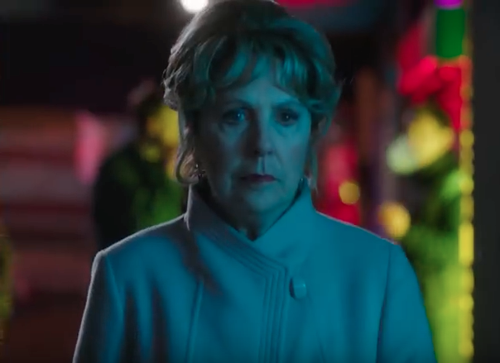 'Brief Encounters', starring newly honoured Dame Penelope Wilton, coming very soon to ITV. Transmission date to be announced shortly. 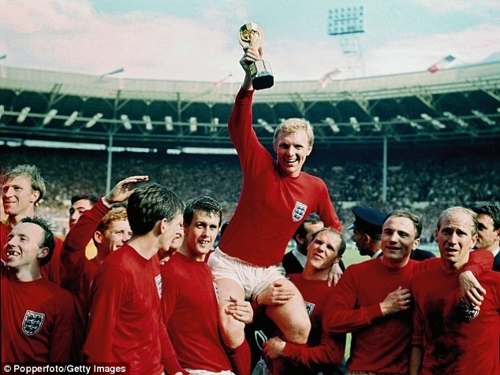 Prep starting shortly on 'Tina and Bobby' for ITV; a dramatisation of the the life and footballing career of Bobby Moore, as seen through the eyes of his wife Tina. 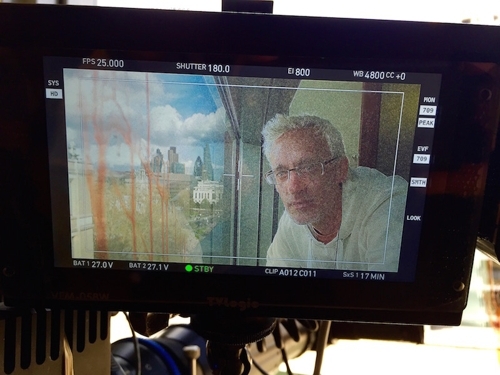 Looking forward to reuniting with director John McKay, picking up where we left off in 2012 on 'We'll Take Manhattan'. A less bloody reprise of a shot from 'Critical' but this time with an Aladdin instead of the Lite Panels 'Brick Light' used back then. 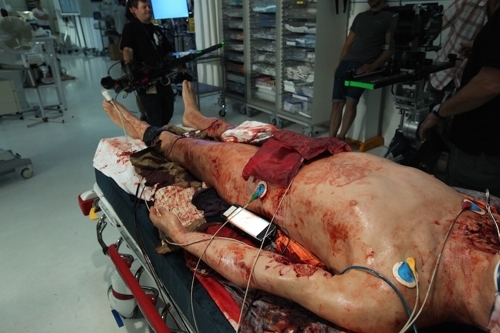 It works well as an eye light for anybody working on the patient/cadaver. The lightweight Aladdin was more user friendly as it didn't leave any indentations in the prosthetic and the shallow profile kept it more easily hidden from camera. Standing in are 2nd AC Eliot Stone and camera trainee Kate McMillan. Best Boy, Josh Dempsey, introduced me to this new range of bi-colour LED eye lights manufactured by Aladdin. They have a high CRI and deliver very pure colour. The profile of the lampheads is nice and shallow and the units come with a with a well thought out set of accessories from mini diffusers to magnetic base plates. 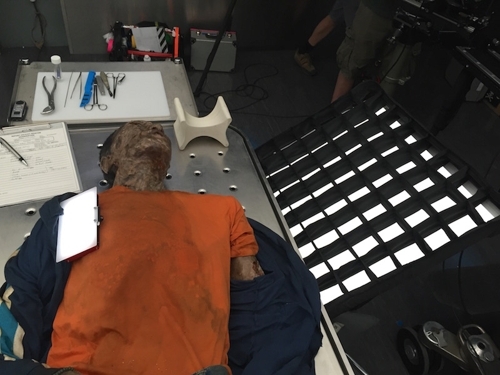 The magnets came into their own on the metallic morgue set. Watch the film to see how easy it was to attach a lamp to the inside of a refrigerated body storage bay. 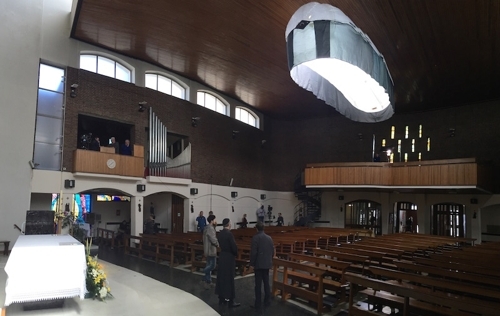 10kw daylight Leelium balloon in St Anselm's RC Church, Southall. In this scene the van's backdoors were opened, releasing a swarm of flies. 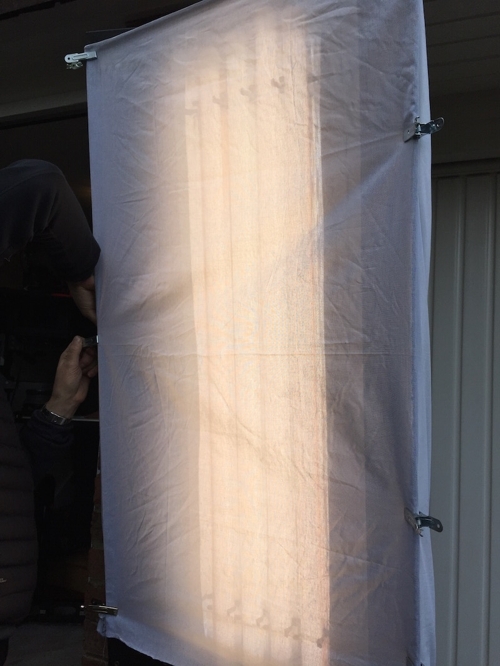 The camera and cameraman were protected by a plastic membrane. Once again the trusty probe came into its element. 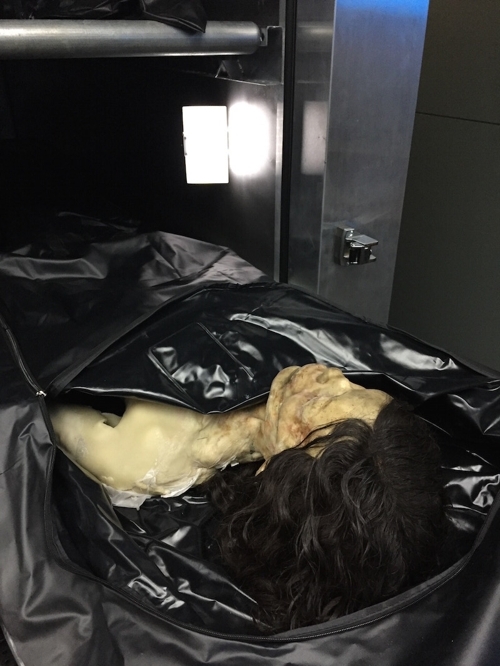 Only a smallish hole needed to be cut into the plastic and as a bonus the probe allowed for a useful degree of camera movement, tracking into the horrified face of the person making the grisly discovery. 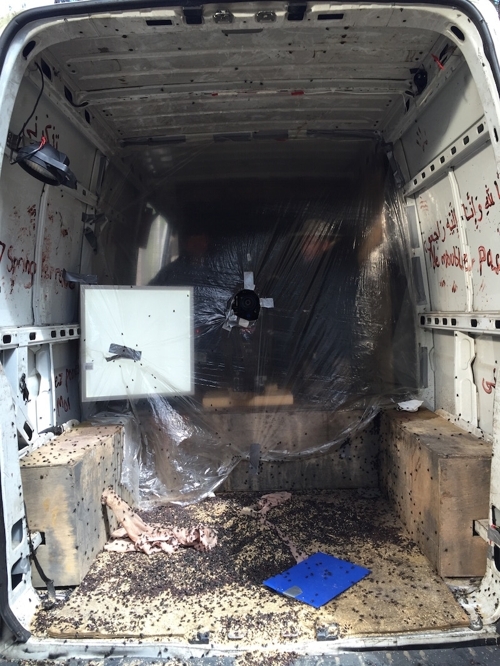 Tens of thousands of flies were poured into the back of the van in anticipation of their great escape. When the doors opened however they didn't budge an inch. Lack of sunlight, even for fifteen seconds, rendered them totally dormant. It was up to the fly wrangler to cast his magic spell and wake them up, which they eventually did and to truely gruesome effect. Needless to say, not a single fly landed on me. Rig of the Week 'Silent Witness' - 20/05/16. 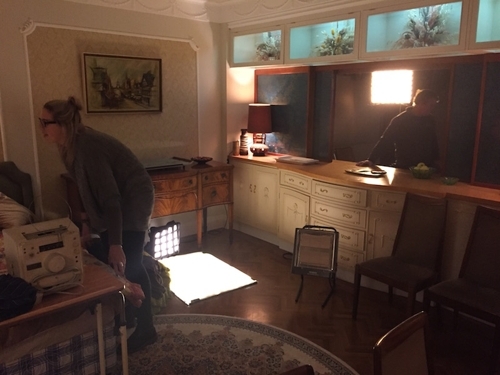 Another tiny location with nowwhere to light from. Couldn't come through the window. Couldn't rig from the ceiling. The floor was knee deep in detritus that was intrinsic to the shot. The top of the cupboard was the only dead area. Ever resourceful gaffer, George Vince, came up with a practical solution. 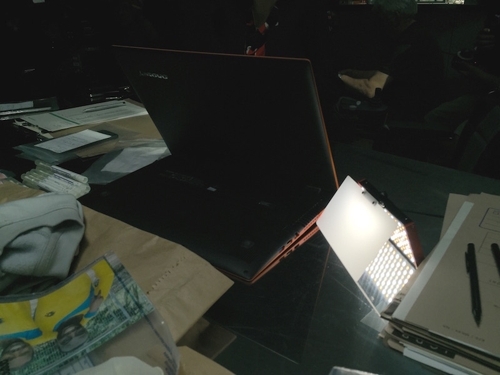 Two Panalux Tektile LEDs on a double swan neck on a base plate. It was a pig to rig but did the job very well. The only way in was for the cameraman to go in first and and then have the camera built up around him. There was no escape until the shot was done. Holding off on the apple crumble and custard at lunch was a wise move. 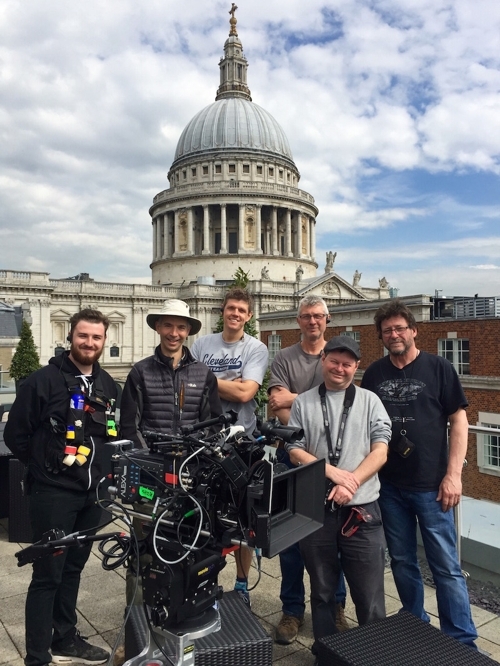 Left to right: 2nd AC, Eliot Stone; DoP, Tim Palmer BSC; Assistant Grip, Owen Charnley; Grip, Gary Norman; Focus Puller, Richard Brierley; Gaffer, George Vince. 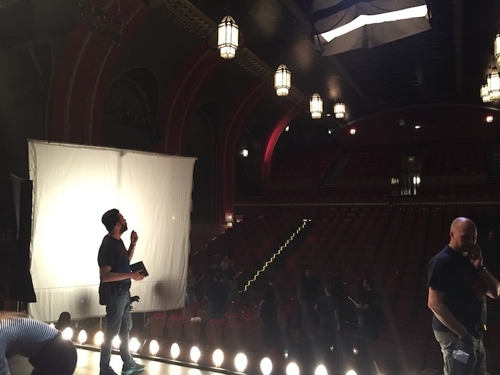 The last time I used large daylight Chimeras was the last time I worked with George Vince. in 2011. 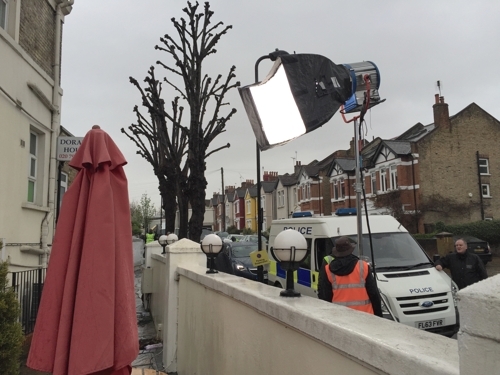 Thankfully he was with me here on Silent Witness to remind me of how versatile and space saving they were on large exteriors especially in poor weather. Due to the dual external and internal baffle design the quality of the soft light is very delicate and the colour is pure. Thanks George; they'll be with me on every job from now on - and hopefully so will you. Gaffer George Vince rigged six Panalulux Highlilite 440s inside a 12' x 12' softbox and suspended the rig from a Genie Boom arm. The lamps were gelled with the appropriate moonlight colours. For a cool toned moonlight look, this was a quick, lightweight and economical way of getting to a daylight starting point. We also used the Highlites in the studio instead of space lights (see bottom photo). 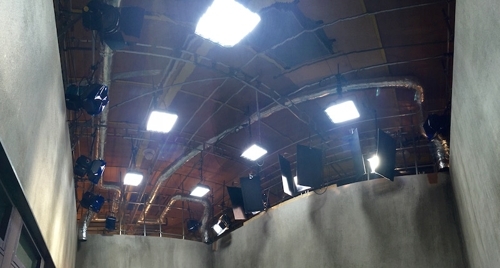 They put out more than enough light and are fully DMX controllable. 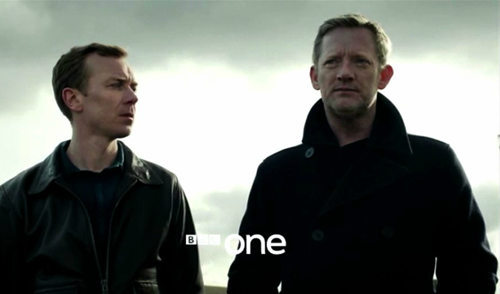 Martin and Richard, BFF. 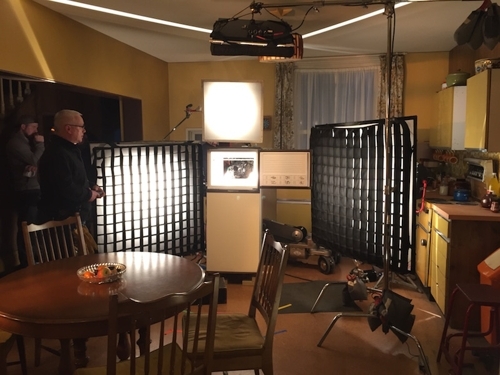 The actors could not be 'cheated' away from the fridge door because the action involved them interacting with what was in front of them. The lens had to be right by the opening. It would have been far too complicated to build a rig inside the refrigerator. The periscope provided a very neat solution. 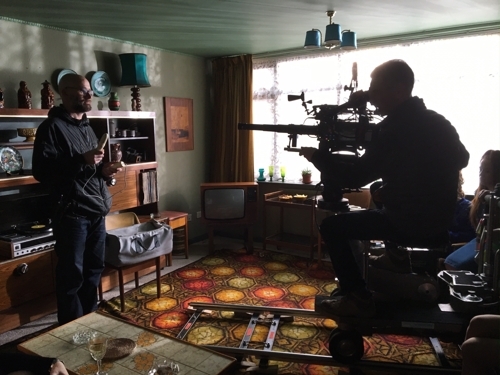 Knowing the stop limitiations of this lens, T5.6, experience on 'Critical' was drawn on, to light the set to 5.6, which gave us the confidence to use the lens whenever needed without having to increase the light levels for the shot. 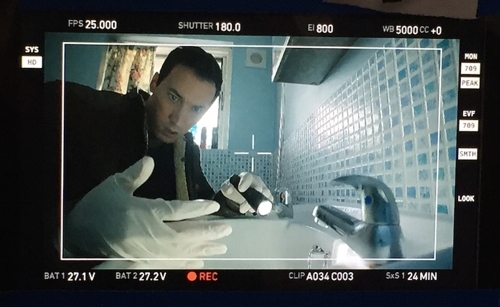 Now in the capapable hands of probe expert extraordinaire, camera operator Martin Foley, the tiniest location ever is no match for the shot finding potential of this lens. Martin and grip Gary Norman, devised an ingenious rig that allowed the camera to track, pan and tilt in a shot that developed from a wide to an extreme close up. 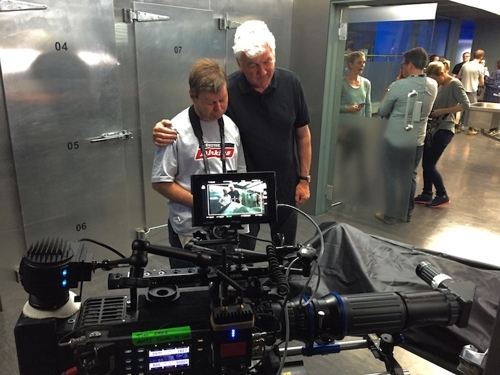 Of course not forgetting the third member of this holy trinity of camera experts, focus puller Richard Brierley. Without his invaluable experience, the shot would not have been achievable in the brief amount of time we had. 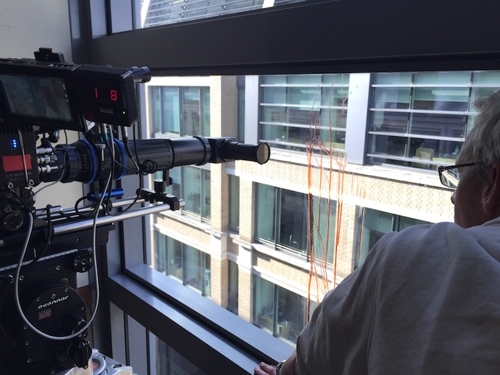 For a shot that required the lens to be closer to the window than possible with a conventional setup and also to be able to focus on the bloodstains in the extreme foreground. 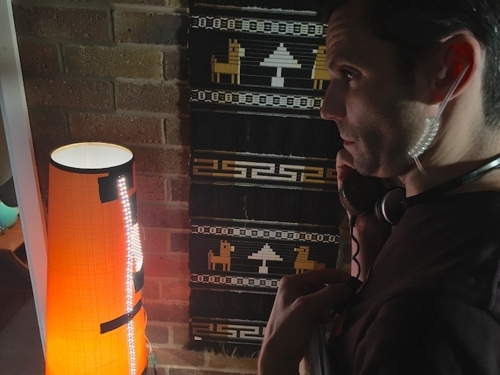 First Assistant Director, Kiaran Murray-Smith, performs stand-in duty. 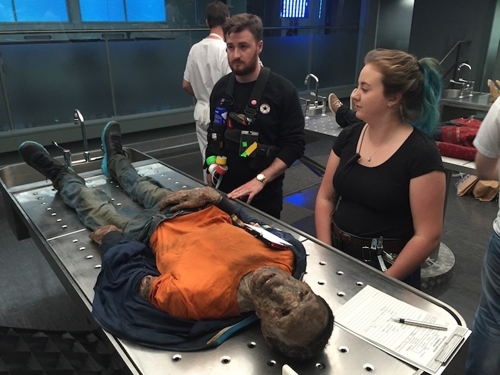 In prep now on episode 1 of the new series of Silent Witness with director Stewart Svaasand. It's great to be back. I'm off now. 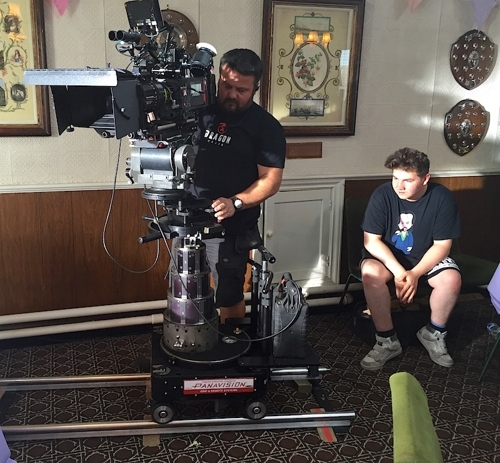 My job is done and the extremely able and talented Nick Dance BSC is taking over on Block 3 with director Joss Agnew. 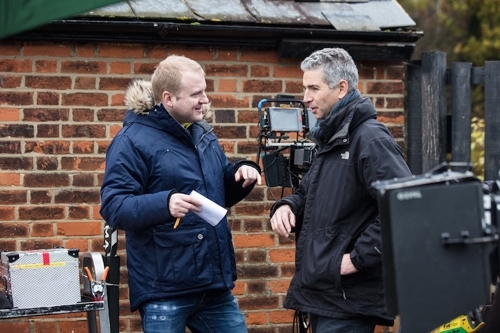 A big thank you to director Marek Losey, producer Jo Willett and everybody at CPL Productions for bringing me on board. This has been a great show to work on. Here with ace gaffer Trevor Chaisty. Even when there is NO space, there is always a way to get the biggest, softest source as close to your leading lady as possible for her close up. 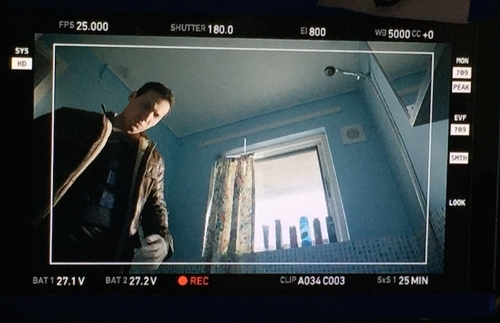 Her action was to be standing at the sink and the shot was a close up of her looking out of the window with her back to the other characters behind her. 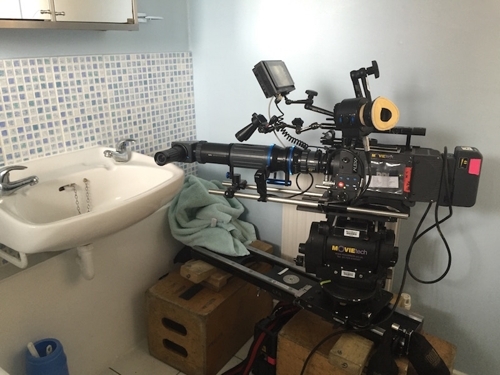 There would not enough have been enough space for the camera if she had really been at the sink so an improvised hand rail was set up forward of the sink for her to hold on to. This allowed the camera to be positioned far enough in front of her to get a good close up on a flattering lens as opposed to on a 14mm from two inches away!! A tight squeeze to say the least and there was little left to do but laugh and get on with it. Anyway it afforded the opportunity for some amusing pictures. How did we all fit? 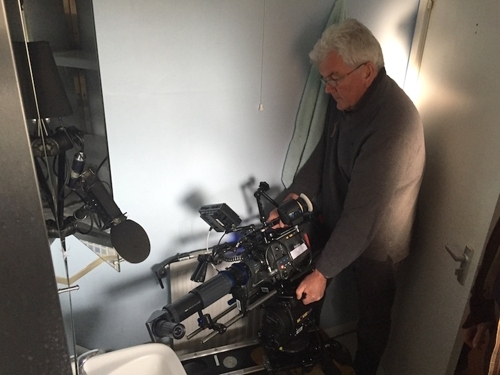 Below, from left to right: Paul Hanning, A cam focus puller, in the only vacant space he could find for himself; myself; Steve Marles GBCT, B cam focus; Jamie Hicks, B cam operator. In the picture beneath, Jamie Hicks is on the left and I'm on the right, never far away from an LED eye light. 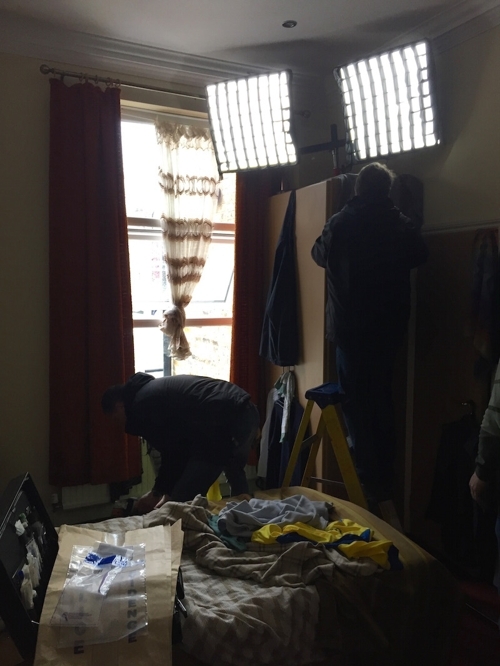 There are times when it simply feels right to light a location day interior scene with tungsten rather than HMI. The softness, punch and spread that you get from a Maxi Brute or Dino is incomparable when it comes to recreating natural sunlight. I always carry a couple of Maxis for just these occasions. Don't look too closely at what Steve Robinson, first assistant director, is holding. The probe is zeroing in for a massive close up. 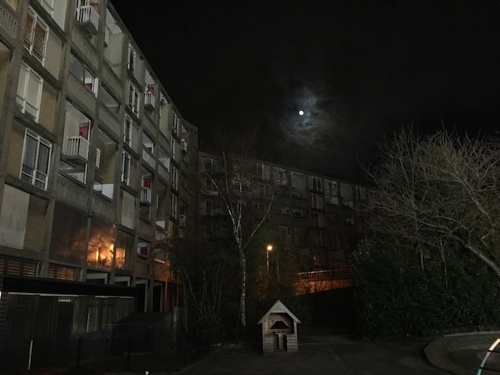 The Park Hill Flats in Sheffield are architecturally renowned as one of the first grandiose social housing developments in Britain to be built in the Brutalist style. 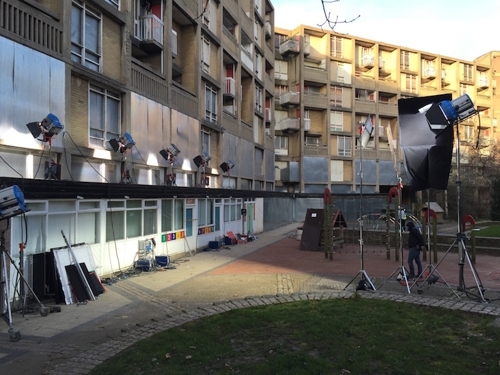 Inspired by Le Courbusier, building work was completed in 1961 and the estate gained prominence as one of the foremost examples of modernist utopian design. The corridors connecting all the flats were even wide enough for a milk float to drive down. Now abandoned and derelict but benefiting from a Grade 2 English Heritage protective order, Park Hill became our playground for a few days last week. 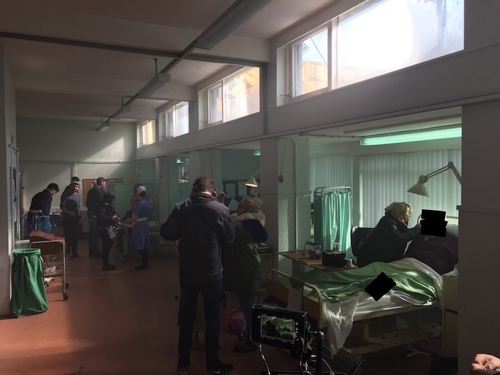 Apart from using various flats and corridors, a ground floor community centre was turned into a hospital ward, which had to be lit for day whilst accomodating fading light outside. 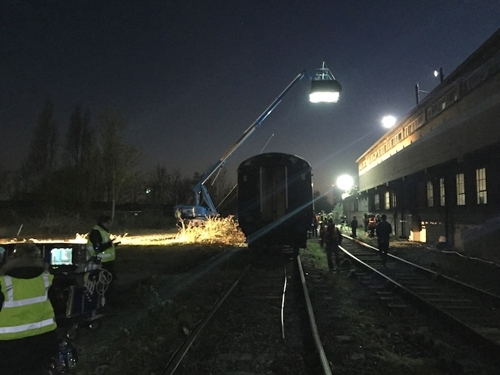 A tidy rig of 2.5K HMIs on the roof and an Arri M90 on the ground turned night into day with ease. 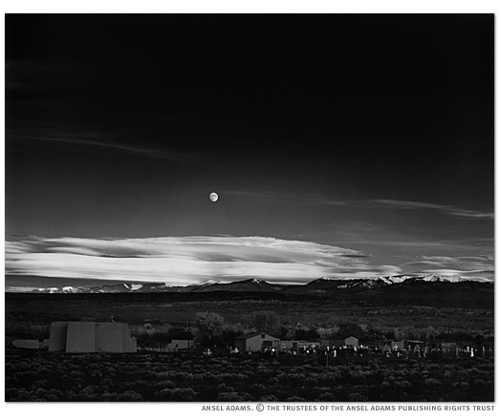 'Moonrise, Park Hill' was an homage of sorts to 'Moonrise, Hernandez' by Ansel Adams. I wonder what the great man would make of the iPhone. They are getting pretty good these day but still might struggle to compete with his Deardorff (still in production), Cooke Taylor Hobson lens and a sheet of 10 x 8" Tri-X film. 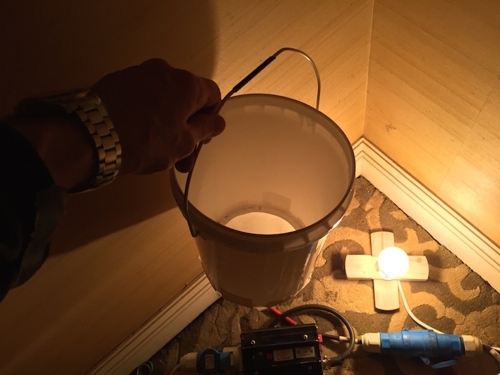 When you're after that little glow behind a piece of furniture or you need to lift a dark corner of a room, gaffer Trevor Chaisty's 'Bucket Light' is just the ticket. The key to its success is the criss cross wooden batten with the lamp housing sunk into a recess in the centre of the cross. This allows the rim of the bucket to rest snugly on the lip of the batten whilst keeping everything cool by letting air circulate around the notch in the wood. 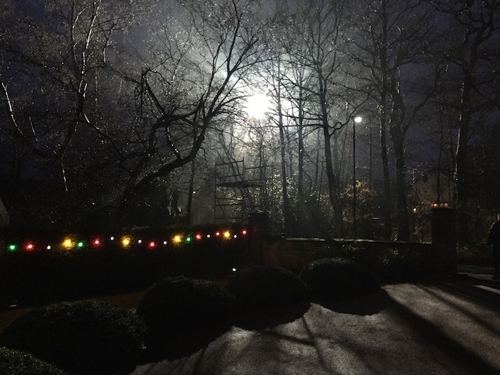 A big lamp backlighting leafless tree branches through light misty rain at night is one of this job's great visual treats. When the conditions are right it always looks fantastic. 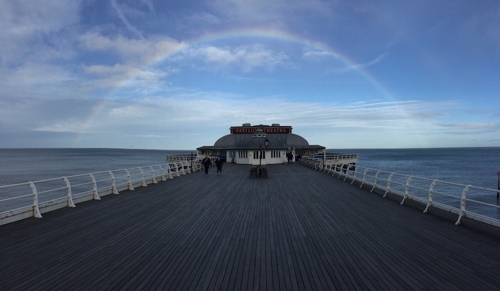 We were very lucky on this particular evening. Note the street light in the distance. It is one of the new LED types and daylight balanced. What a blessed relief to get away from horrible sodium lights. 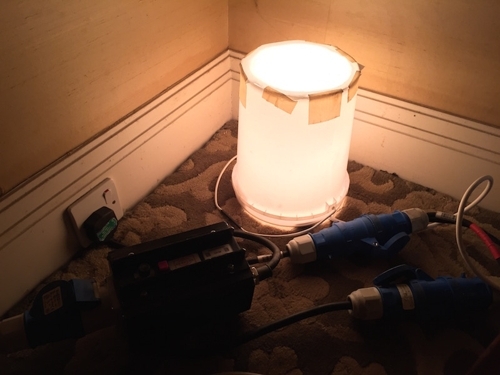 We embraced the blue colouration with gusto and nobody can tell that the lamps are encased in modern housings. 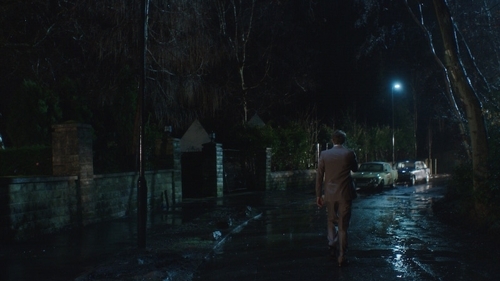 They hark back to the greenish mercury vapour lamps prevalent in the USA in the 1970s and therefore suited the visual blueprint of 'Brief Encounters'. 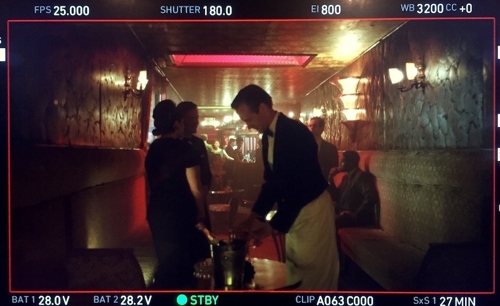 Three five foot Dedoflex Octodomes were used for this party scene shot on steadicam by Paul Edwards. The shots had to take in a 360 degree view so soft top light seemed like a good strategy. 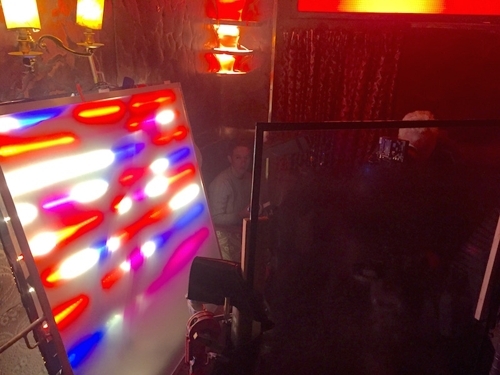 Kino Flos would not have given sufficient spread; nor would larger LED panels, which also would have been too heavy. Springballs or Chinese lanterns would have hung too low into the set and would have been reflected in the large windows at either end of the room. The shallow profile Octodome was the perfect solution and with its well fitted egg crate, reflections were never a problem.The only additional interior lighting was a hand held Lite Panels bi-colour LED. Running around with a hand basher reminded gaffer Andy Taylor 'Tala' of his days working on news programs at STV. He became quite nostalgic! 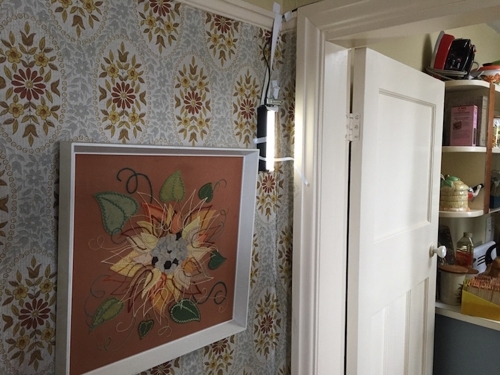 According to electrician Gary Owen, when a light has been 'strazzed' it means that the lamp has been shoved into whatever space there is available to allow it to do its job properly without being fixed or fastened to any conventional lighting grip apparatus. 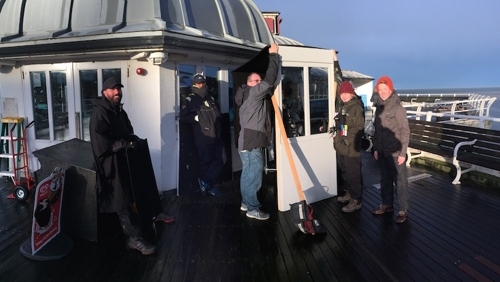 The term is named after esteemed cinematographer Ivan Strasburg, famed for his cavalier approach to rigging lights in whichever way suited him much to the chagrin of the health and safety Gestapo. 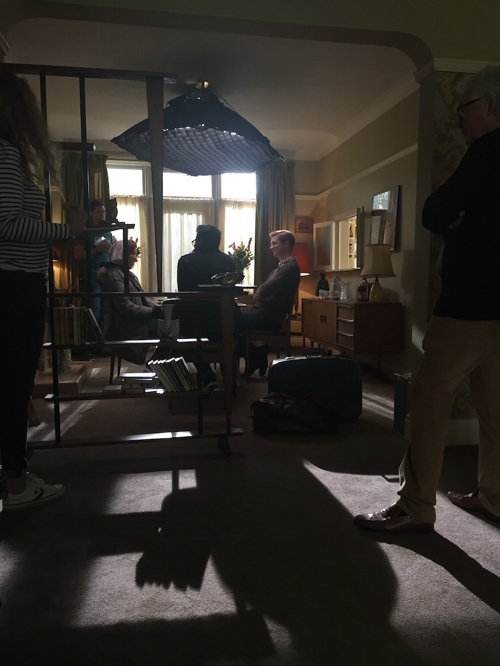 Here, for a bedroom scene, where the lighting had to emulate the light from bedside table lamps, the lights were well and truly 'strazzed'. Ivan would be proud of his legacy. 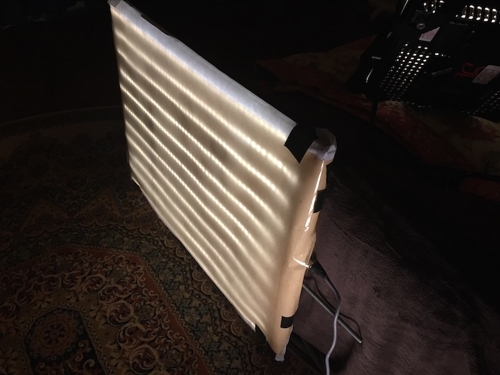 In mitigation, because these were all LED units, they did not constitue a fire hazard despite the highly flammable 1970s nylon bedding. 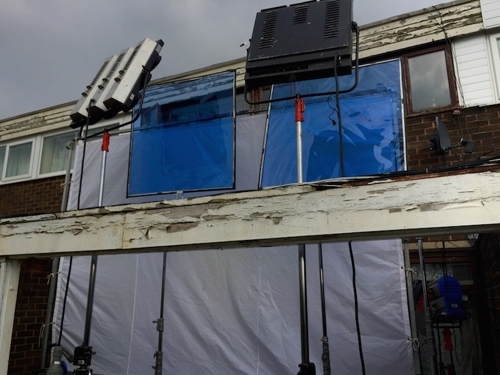 Christened the 'Death From Above' light by gaffer Trevor Chaisty, this LED unit designed and built by gaffer David Manfield 'Manny', comprises strips of bi-colour LED ribbon attached to a sheet of lightweight corrugated plastic and stretched over a simple flag frame. It is colour switchable, dimmable and controlled by a remote unit. 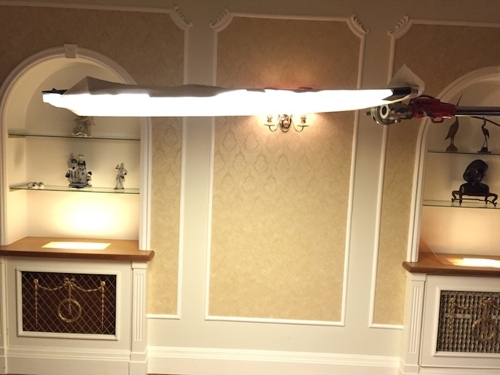 It has proven invaluable when needing to fly a soft overhad top light in a low-ceilinged room. The profile of the lamp is minimal so it rests flush with the ceiling. 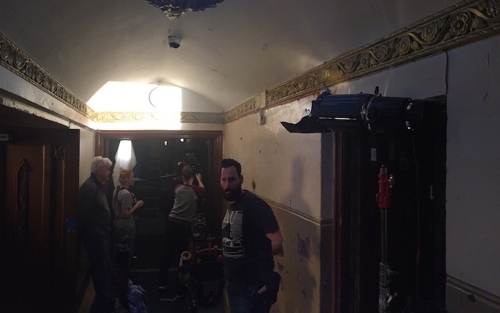 I found another practical use for it as the 'Death From Below' on a 14mm wide shot in a small room with six principal actors moving around. The lens saw everything in the room except for the floor behind the bed and then only the first two inches above the floor. Laying flat on the ground, the lamp was just out of shot and produced enough subtle fill to enhance the practicals without feeling unnatural. 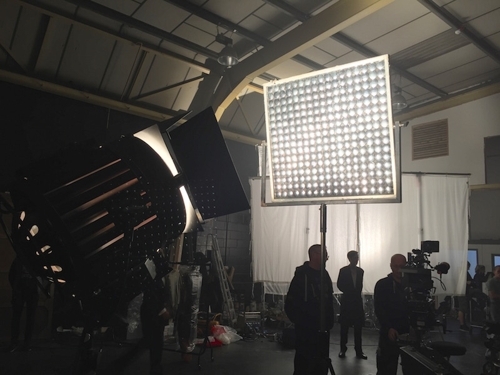 Arri's versatile new LED soft light, the SkyPanel, was put to excellent use in this factory floor scene. 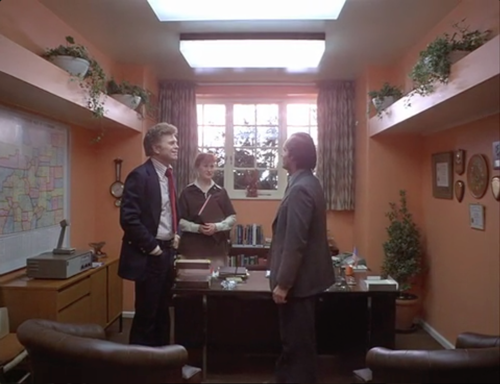 The location was dominated by a vast array of fluorescent lights so any film lighting had to match the colour of the fluorescents. It took a matter of seconds to scroll through the colour temperature and magenta/green settings on the SkyPanel before finding a perfect match. Yes, one can use a colour temperature meter and gel the lamps appropriately but this is never a perfect science, especially with digital. It is also time consuming and a costly use of lighting gels. The human eye and the individual camera's sensor are the only true judge. In addition the SkyPanel offers up a full range of RGB effects colours as demonstrated in the video below. 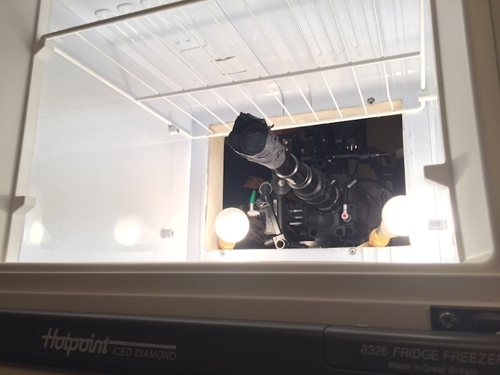 For a shot that begins outside a fridge on the faces of a group of people peering in and then tracks back to reveal the contents of said fridge, the trusty probe lens was the right tool for the job. This version is Panavision's Innovision lens. 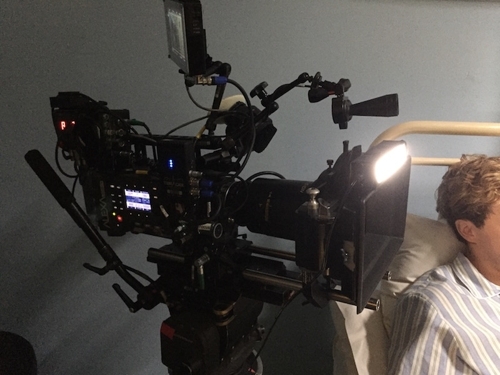 It's not quite as sharp as the Optex Excellence but for the period look we are recreating the character of the lens bedded in perfectly with the feel of the show. The diamater of the Innovision's barrel is narrower too, which offered up a little extra flexibility when moving through the opening in the fridge. 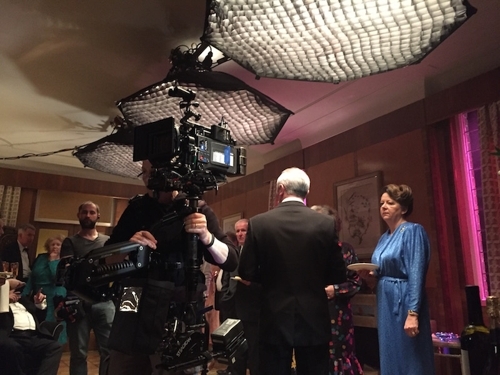 The intense amount of light on set was necessary to get a good exposure on the T8 lenses. The normal shooting stop with the Zeiss Super Speeds we use is around T2 so this shot required 8x as much light to match the look of everything else. It was not just the key light that needed boosting but all the practicals in the background had to be uprated with 100w bulbs set at full brightness. 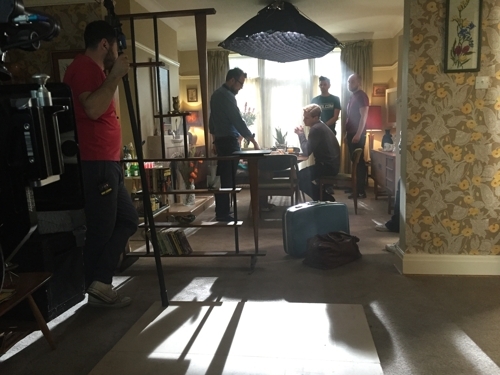 Gaffer Trevor Chaisty is adjusting a Snapgrid on one of the diffusion frames. The six amigos at the end of the demonstration video are, from left to right: Trevor Chaisty - gaffer, Nicola Brown - floor runner, Hannah Cooke - 3rd AD, Geoff Blackburn - standby props, Steve Robinson - 1st AD, Ramon Pyndiah - Boom Op. 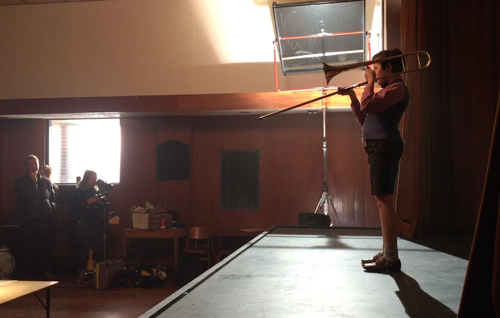 Andrew Binns, 2nd AC, is operating the camera in the video clip. 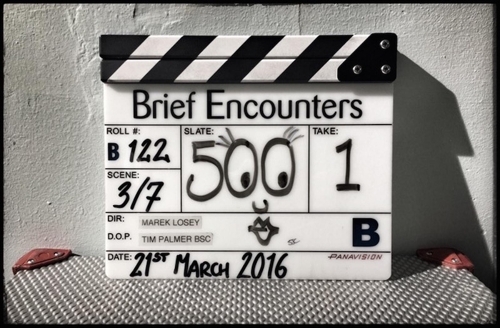 Filming to start soon on new ITV drama 'Brief Encounters', with director Marek Losey. 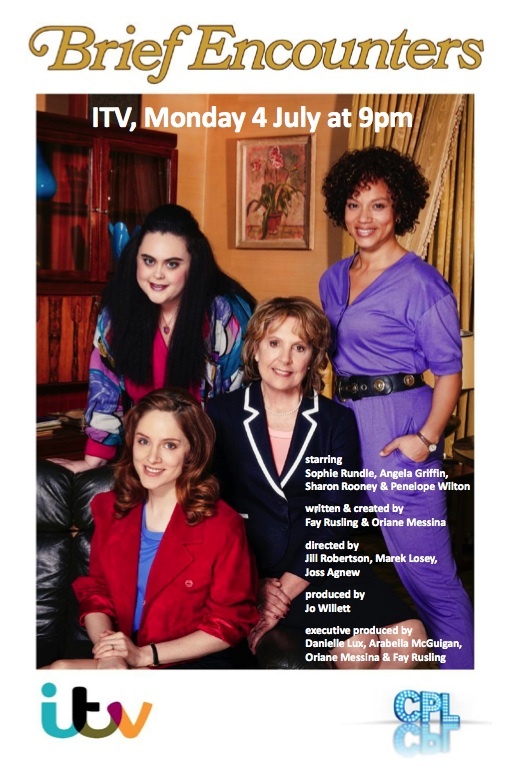 The series is based on the memoirs of Anne Summers CEO, Jaqueline Gold, penned in her book 'Good Vibrations'. 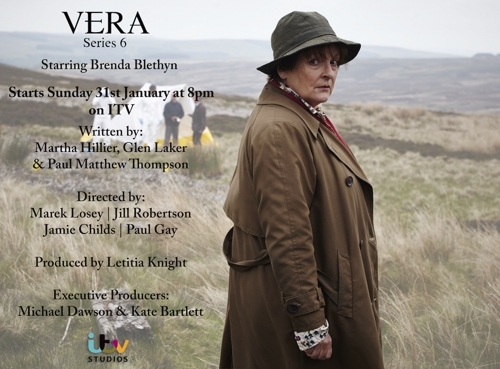 Across six series of crime drama 'Vera' starring Brenda Blethyn, episode 1 of the new series, directed by Marek Losey and photographed by your humble scribe, achieved the second highest viewing figures in the show's history. This has never been a forum for personal thoughts but in light of today's sad news I wanted to make an exception and say a few words. Growing up in London in the late 1970s we were all brought up on Bowie. I vividly remember the first time I heard Ziggy Stardust. It was a transformative experience and if this spotty teenager had any nascent artistic inclinations at the time, it was David Bowie's music that became the incubator. I was studying German for A Level and recall being on an exchange program with a school in Munich. It coincided with the release of the film 'Christiane F - Wir Kinder vom Bahnhof Zoo'. Set in drug ravaged East Berlin during arguably Bowie's most creative period, the film based itself on his music and some of his most seminal live performances. With great excitement I dragged my very upstanding host family to the cinema to see the film. Needless to say they were utterly horrified but curiously transfixed at the same time. Twenty seven years later I finally came across a battered VHS of the film in a forgotten old record shop in Manchester, coincidentally whilst filming the apocryphal final scene in the last ever episode of the BBC drama 'Life on Mars'. David Bowie; your music, your spirit and your genius will live on forever. 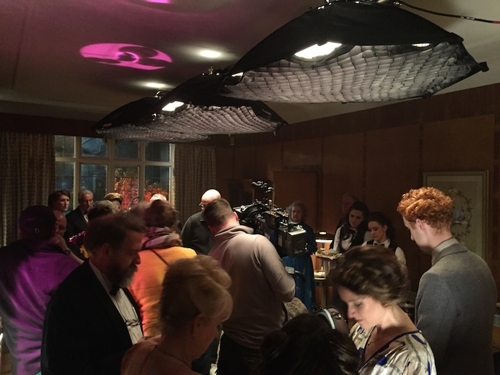 The new series of 'Shetland' begins on Friday, January 15th 2016 - BBC1 9.00pm. Click below to view trailer. 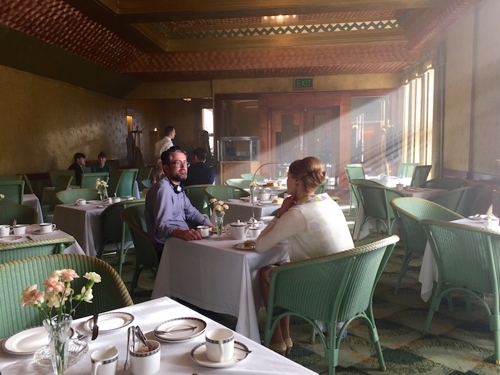 Indian Summers Series 2 coming soon to Channel 4.